The two rag rugs I completed this week were closer to the kind of result I have been aiming for but had not quite achieved. The rugs used a double thickness of weft, made up of old business shirts and old sheets cut into 1 inch (2.5 cm strips) sewn together. The two weft strips were of different fabrics in the yellow toned rug and I am very pleased with the variation in tone that this achieved. I chose to make folded hems as it’s likely they’ll end up as bath mats and experience has taught me that a fringed finish is like a magnet for fluff. Also I expect a folded hem to wear very well. The new pro-tip from this project was serging (overlocking) the ends of the rug when they came off the loom. This gave me a tidy finish and secure ends. Sett was 10 dpi in a 10 dent reed, threading was rosepath over 8. 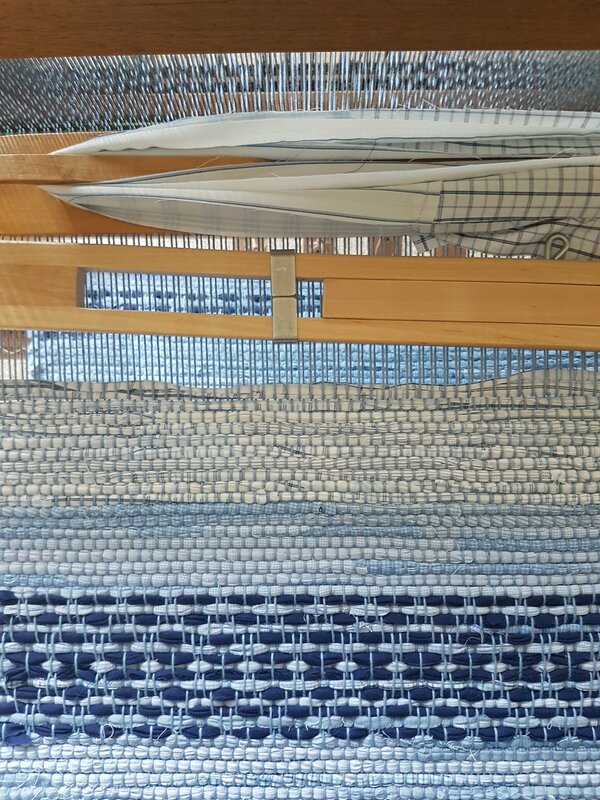 Warp 8/4 cotton in blue. This rag rag was always intended to be a test. It was the first time I used warp from my big cone of 8/4 cotton rug warp, a first time using a temple (stretcher), a first time finishing a rug with a turned edge and a first time weaving with a rose path threading. Don’t keep threading after you start feeling tired. You will regret it when you find yourself rethreading the following day. Measure twice, cut once. I was two warp threads short. The problem was easily solved with a new length of warp and some washers for weights, but I had to think about how to solve it. Using a temple is well worthwhile. No draw in visible this time. 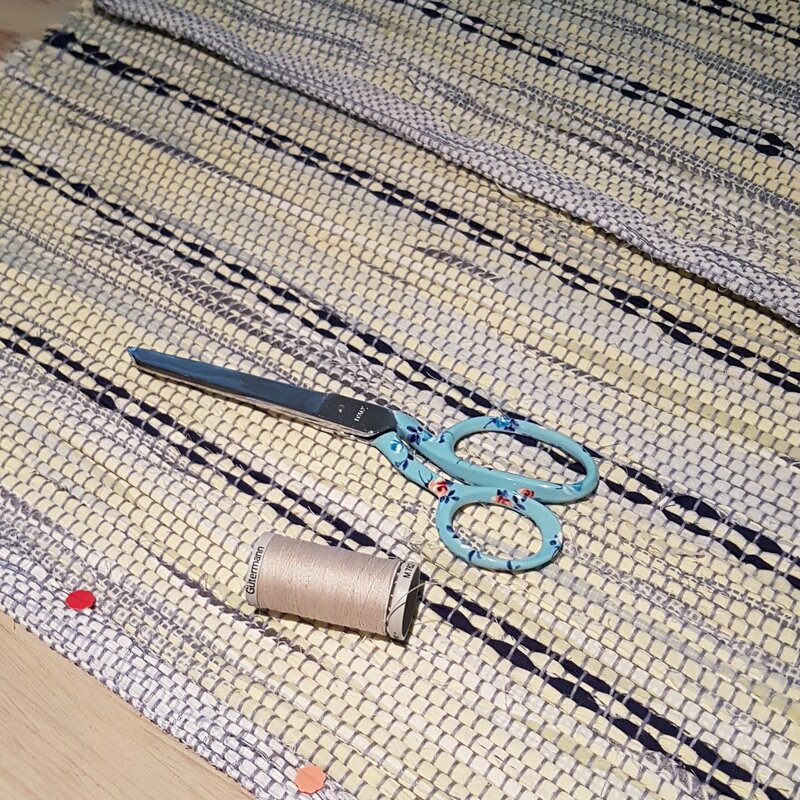 It’s worth the time sewing strips together for the weft but this only worked well for me with the main pattern 1 1/2 inch strips. The sewn joins on the narrower 1cm strips that I used for the hemmed edges pulled apart under tension. 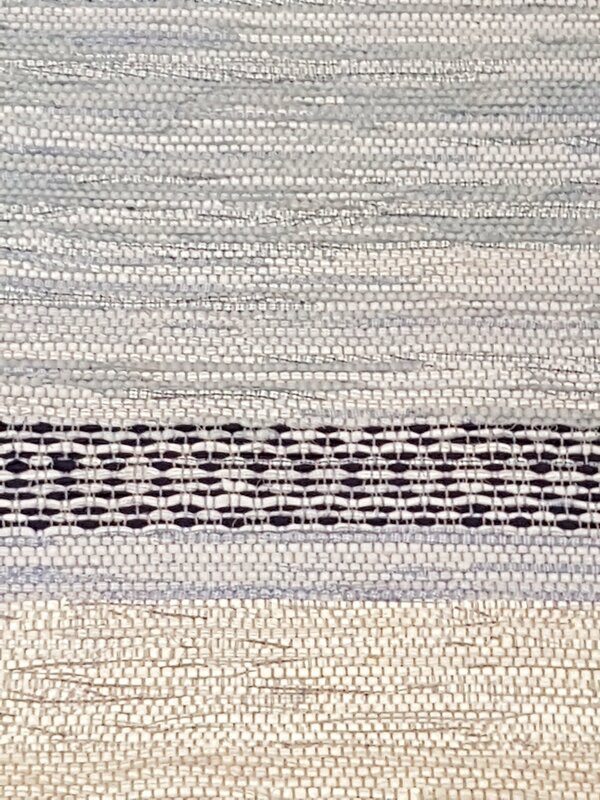 Worn out sheets make excellent weft strips. 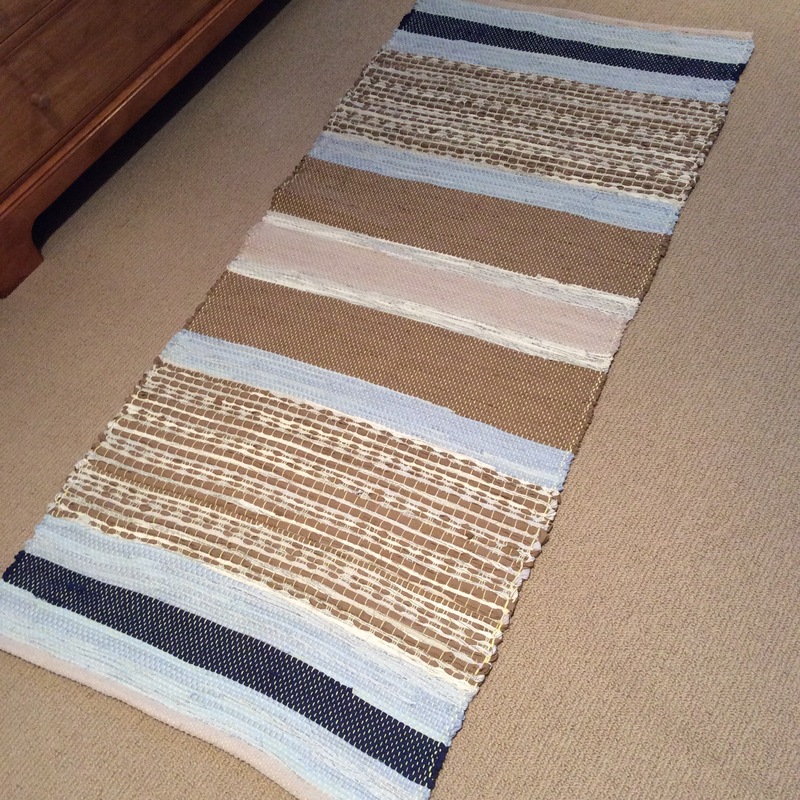 This rug has a combination of worn fabrics (old sheets and shirts) and new fabrics (the dark blue is a remnant and the brown is a never used bed skirt from the op shop.) The worn fabrics packed in better and were less rigid in the finished mat. Don’t be frightened to make up your own design. Magazines and books are great but so are your pencil, your calculator and your mind. One of the reasons I bought the huge mill end spool of cotton rug warp was so I could experiment freely without worrying about wasting expensive rug warp. The rose path threading yielded sections with patterns that remind me of the beach. It’s a lot less formal a look than I had in mind but I like the unstructured look. Having said that, the rose path border patterns I tried to achieve were a total bust. I don’t know what went wrong and I’m keen to try again. I plan to have a crack at dying the warp next. I like the yellow, but I also like variety.